Thom Southerland's production of Jerry Herman’s The Grand Tour may tell a bittersweet fable, but the show defines all that is good in fringe theatre today. Whilst Broadway success may have eluded its 1979 premier, a staging in the 50 seater Finborough offers the rare privilege of seeing this eclectic work make its maiden voyage across the Atlantic. The pedigree of Herman, Bramble and Stewart was already established when they collaborated on this tale of tragic whimsy, set against a backdrop of France's encroaching Nazi occupation. Jacobowsky, a Jew who has already fled his native Poland and subsequently Austria and Czechoslovakia must flee Paris. So too must Colonel Stjerbinsky of the exiled Polish Army. Like the Nazis, Stjerbinksy hates Jews but the Germans are after both men and so out of necessity an unlikely allegiance is formed. Throw in a beautiful French woman Marianne, to whom not only is the Colonel betrothed but who can also recognise the human decency of Jacobowsky and the tale evolves into the most tragi-comic of Road movies, as the Holocaust’s tragedy looms. Alastair Brookshaw’s Jacobowsky is a stunning performance that leads the show. Avoiding caricature, Brookshaw (an actor whose choral career has seen him more accustomed to Westminster’s Abbey rather than Syngaogue and who now, following his outstanding Leo Frank in Tarento’s 2011 Parade confirms his Jewish credentials) nails Jacobowsky’s desperate vulnerability in a performance that combines hilarious chutzpah with profound pathos. Onstage almost throughout, Brookshaw’s opening number I’ll Be Here Tomorrow, sung as he walks, stumbling, across the outstretched arms of the company, evokes the frailty and the tragedy of the time perfectly. Nic Kyle is the Colonel. His is a tough act, playing the bad-guy/straight-guy to Jacobowsky’s antics, yet the kiwi Kyle skilfully manages his character’s transition as he learns to love his Jewish travelling companion. Completing the trio is Zoe Doano’s Marianne. Doano’s singing matched by her perfect poise and presence that convinces without once becoming sugary, evidences her West End experience. As well as producing, Danielle Tarento casts the show and her eye for talent is, as ever, spot on. Blair Robertson’s murderous SS Captain defines a villainy that is cliché free, whilst Vincent Pirillo’s Jewish father whose grief as the Nazis destroy his daughter’s wedding (in a scene that is one of several gloriously choreographed routines from Cressida Carre) is a beautifully sung turn that also avoids melodrama. 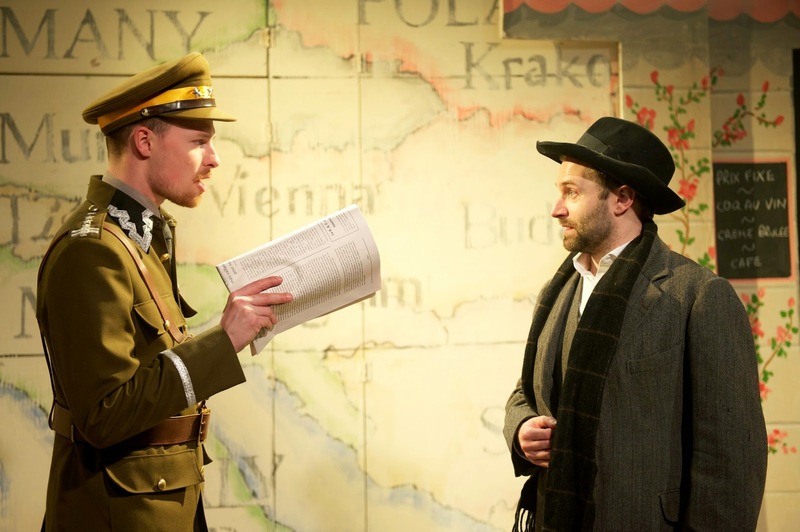 The Finborough’s stage is tiny yet Phil Lindley’s ingenious scenery, comprising panels that open to reveal differing backdrops sets the locations wonderfully. The act one closing number, One Extraordinary Thing, set in a circus big top complete with high wire routine is a particular delight. Max Pappenheim’s well crafted sound design adds authenticity, whilst Joanna Cichonska’s filleting of the orchestral score to an arrangement for just two pianos maintains the charm of Herman’s melodies whilst never drowning the un-mic’d actors. Southerland has got the balance of song and setting just right – every lyric is crystal clear. Reflecting the fate of France’s Jews, The Grand Tour offers no happy ending. The narrative may be fiction, but the backdrop is the most painful truth and in this expertly assembled troupe, Danielle Tarento offers up yet another slice of theatrical genius.